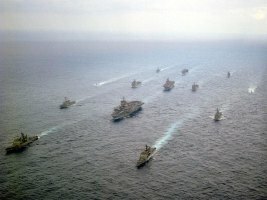 Banner image: USS Enterprise (CVN-65) battle group near Puerto Rico on 7 May 2001 (U.S. Navy photograph by Photographer's Mate Airman Apprentice Doug Pearlman). Copyright © 2001-2015, 2017 by Wm. Robert Johnston. All rights reserved. Last modified 11 November 2017.